Turbochargers and reliability: two words that were not linked together at the dawn of the first turbocharge era in Formula One, 1977. Renault’s initial turbocharged engine had a very rocky start and was plagued by overheating and multiple failures, as well as problems associated with its increased weight and massive turbo lag. Supercharged engines had been allowed in Formula One from its inception in 1950 and had initially been widely used. However, due to problems with excessive fuel consumption and difficulties with cooling they had been falling out of favour with nobody taking up the option since 1951. The last win for a supercharged car had been in 1951 when Fangio had won, at Spain, in his Alfa Romeo. From 1961 compressors were banned and engines were decreased to a maximum size of 1.5 litres. In 1966, the engine capacity for normally aspirated engines was once more increased to 3 litres and the 1.5 litre supercharged engines were again permitted. Even then, the teams were slow to take up the alternative and it would be more than ten years before Renault would make their first foray into Formula One, racing at the British Grand Prix in 1977 with their ground breaking Renault-Gordini V6 1.5 litre turbocharged engine. Renault had been experimenting with turbochargers on their sports car engines for several years, and by 1975 they were winning races with them. 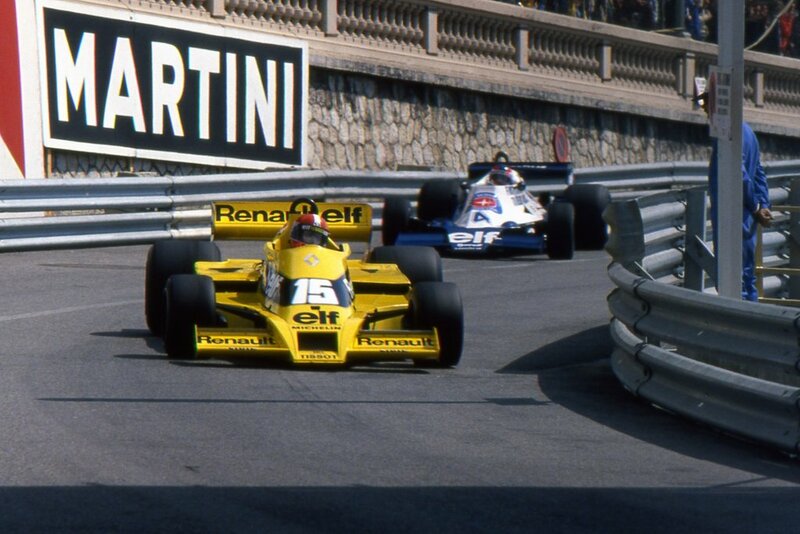 In 1977 they hired Jean-Pierre Jabouille, not only as their driver, but also for his exceptional engineering skills. He was one of the last Formula One drivers who was also an engineer. His mechanical aptitude made him an ideal candidate for helping to further develop their innovative car and engine. Renault’s first 4 races were troubled by engine and mechanical failures, and their season culminated in failing to qualify at the Canadian Grand Prix where their only driver, Jabouille, struggled to get his tyres up to temperature in the cold and wet qualifying conditions. He was more than 7 seconds behind the pole setter Mario Andretti, making the team decide to withdraw from the closing Grand Prix of the season in Japan. The bright yellow Renault was not taken seriously around the paddock and Ken Tyrrell sarcastically christened it “The Yellow Teapot” due to the fact that it was often seen parked at the side of the track where it had broken down, emitting steam (or smoke!) from its engine. Keith Duckworth, designer of the Cosworth DFV, once said, “I think that in any racing engine, the nearer you are to it disintegrating, in general the better its performance will be.” Unfortunately the Renault turbocharged engine disintegrated far too often! After missing the first two races of the 1978 season the team were keen to prove the ability of their new engine at altitude at Kyalami. Turbocharged engines had a sizable advantage at altitude because they could adjust for the loss of power experienced by normally aspirated engines by making the turbocharger blow harder. They were still using the RS01, but had a new chassis with improved aerodynamics and the car performed well at practice managing 89 laps without a breakdown! Unfortunately, the race ended with another engine failure on lap 38 of the race. It was at Monaco, their eighth race and 10 months after their debut, that Jabouille finally had his first finish, albeit in tenth place and four laps behind the winner, but at least the engine had made it to the end of a race! The 1978 season continued with numerous engine breakdowns (including a low point where the engine failed on the starting grid in France), culminating with their first points finish with a fourth place at the United States Grand Prix, the penultimate race of the season. 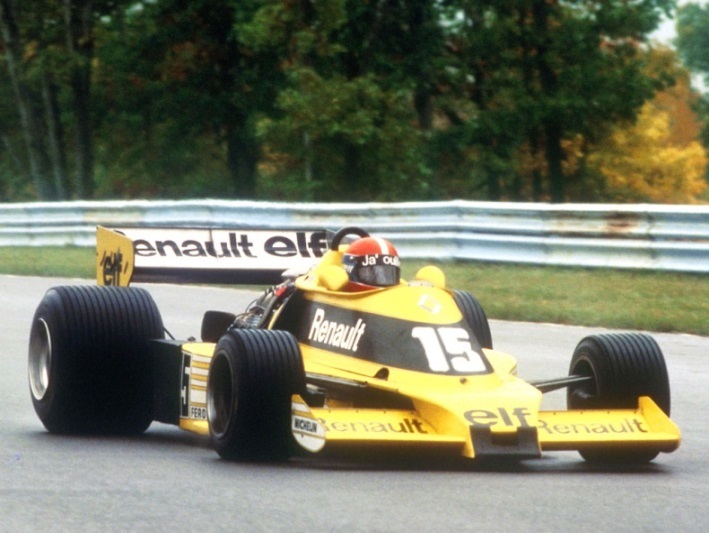 For 1979, Renault were developing a new chassis, the RS10 ground effect car – at the same time they added a second driver to the team. Rene Arnoux, who had won the European Formula 2 Championship in 1977, was now driving alongside Jean-Pierre Jabouille. The RS10 was still not completed so they started the season still driving the modified RS01. It was again a difficult start to the year at the opening race in Argentina, with Jabouille struggling with an overheating engine and Arnoux only managing to complete 14 laps in the two days of practice because of three engine failures. Arnoux failed to qualify for his first race for Renault but was eventually able to start the race as Patrese had to withdraw after a collision during warm-up which left a vacant place on the grid. Both cars had engine failures early in the race. It was at the third race at Kyalami that the Renault team first began to see some positive results from all their hard work when Jabouille surprised everyone by putting his car on pole position in front of the two Ferrari’s. Jabouille managed to fight off the Ferrari’s to keep the lead at the end of the first lap but on the second lap heavy rain started to fall. The two Ferrari’s and Jabouille then exchanged the lead several times over the next two laps despite all of them being on slick tyres and struggling for traction on the increasingly wet track. The race was red flagged at the end of the third lap and following the restart Jabouille suffered another engine failure during the race, just as he was about to pass Andretti for fourth place. Arnoux had also been going well when he had a left rear tyre blow-out which took him out of the race. It was at the 1979 Monaco Grand Prix that the team first fitted their new twin-turbo engine to their brand new ground effects RS10 chassis. The cars performance with twin-turbo was so superior that Jabouille and Arnoux no longer recognised their engines as the throttle response time was so fast. However, they still struggled to qualify due to ongoing mechanical issues and neither car finished the race. It was at the very next race, at Dijon in France, that the all the pieces finally fell into place. Due to the cancellation of the Swedish Grand Prix, Renault had had more than a month extra development time to prepare and test their car for the French Grand Prix. During qualifying Jabouille got his second pole position for the year with Arnoux beside him on the front of the grid. When the car finally managed to get to the end of the race without breaking down Jabouille was still in the lead, with Arnoux and Villeneuve almost 15 seconds behind fighting wheel to wheel for second place all the way to the chequered flag. It was a French driver winning the French Grand Prix in a French car with a French engine, shod with French tyres and powered using French fuel! The team and the local crowd were ecstatic. This was Renault’s first victory since 1906 and the first win for a supercharged engine since Fangio in 1951. Within two years Ferrari had become the first constructor to switch over to turbo power. They won two Grand Prix’s in 1981 having not won any the previous year followed by 1982, winning the Constructor’s Championship. Brabham, with Piquet driving their BMW turbo, was the first turbo powered car to win the Driver’s Championship in 1983. The writing was on the wall for normally aspirated engines. 11 teams in 1982 were using the Ford-Cosworth DFV’s, but by 1984 only Tyrrell used them for the whole season; everyone else had switched over to the new, and increasingly powerful, turbocharged engines. Despite their efforts in introducing and developing turbocharged engines Renault would never win a drivers’ or constructors’ championship with them, their best being 2nd place in the Driver’s Championship with Alain Prost in 1983, as well as 2nd place in the Constructor’s Championship in the same year. It will be interesting to observe in the upcoming 2014 season the challenge of constructing the latest breed of turbocharged engines in Formula One. Despite some early indications from Jerez, the jury is still out on which engine will win the race to become both the fastest and most reliable. Funny how the sport can go round in circles! Thanks for that! That was interesting times; when the teams went to ‘rocket fuel’ (mostly toluene) and cured detonation problems the engines really made insane horsepower. Toluene, turbos, and modern ignition electronics would be an interesting mix……. For anyone interested in F1 turbo engines the book ‘The 1000 BHP Grand Prix Cars’ by Ian Bamsey is a fantastic read. ‘Those were interesting…..’ And I’m a grammarian! Sorry. I know it’s Kyalami not Dijon, but Google tells me 1980. Looks like Renault did even better the next year they went back to SA.. I really like the pics though, and nice insight in the article.. Doc Postlethwaite was always quick to cotton on to new things. It’s from his innovations that we are now having to lower the noses! And doesn’t Bernie look young in the video..
PS. We might have to see how Renault develop their engines again, if the rumours of being down on hp and reliability for now are true. But if we can get another Dijon 1979 like battle out of the situation then it’ll be worth it! 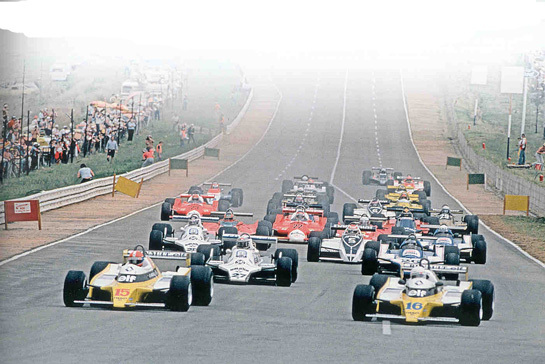 That pic is the start of the 1980 Sth African GP. I’m not sure these were the reasons. Normally aspirated engines, due to better materials, design and manufacturing, were able to rev higher and higher, producing more power, with less internal friction, and reduced weight. Supercharged engines suffered from various problems. The most significant being the inefficiency of the supercharger itself. At the time you had two main types – Roots and Centrifugal. Positive Displacement superchargers ( such as the Roots type ) produce a fixed amount of pressure that doesn’t increase much as the engine increases RPM’s. That means the added benefit decreases at higher RPM’s. Dynamic superchargers ( like centrifugal type ) produce more pressure as the RPM’s increase. You couldn’t produce consistent boost across the whole rev range of the engine – so you had to make a compromise. Power at low – mid RPM or power at high RPM. Also, as these are driven by the engine, they can absorb up to a third of the total crankshaft power of the engine. Plus they are expensive, extremely complex to manufacture, install and are very heavy. As people like John Cooper and Colin Chapman were showing – lightness was becoming more and more important. Then we have the problems produced by supercharging the air itself. Keeping the air that enters the engine cool is an important part of the design. Compressing air increases its temperature, so it is common nowadays to use an intercooler between the supercharger or turbo and the engine to reduce the temperature of the air. Engines of the 50’s & 60’s tended not to have intercoolers, or very inefficient ones. Instead, they relied on the vaporisation of the fuel as the air passed through the carburettor to cool the air. Again not a very efficient solution. You could additionally use things like water injection and the like, to cool the air more – but that’s again greater complication and weight. This meant that ” knocking ” or pre-ignition of the fuel / air mixture in the engine was a major problem – leading to engine destruction. To sum up – what you had was a larger, vastly more expensive and complex engine, that had lower reliability, and that had a lower power to weight ratio than a normally aspirated engine. Sounds a like 2014 to me…..although the technological advances will be invaluable to road and sports cars in the future. The difference is that without the fuel flow restrictions – which a 1950’s engine didn’t have – the 2014 1.6 V6 turbo would produce vastly more power to weight compared to the 2.4 V8’s. Even with the fuel restrictions – if teams had a free choice between the old NA V8 v the new turbo V6 – everyone would still pick the new turbo. That’s why – as Jennie pointed out in this article – why F1 last chose to use turbos …..
For anyone with an hour to spare, the Equinox TV documentary on Cosworth’s development of their (ultimately not very successful) turbo engine is well worth seeking out on YouTube. Search “Turbo F1 Engines – How they started” on YouTube. It’s in two parts and very interesting as it doesn’t treat the viewer as a total ignoramus, unlike today’s TV documentaries. 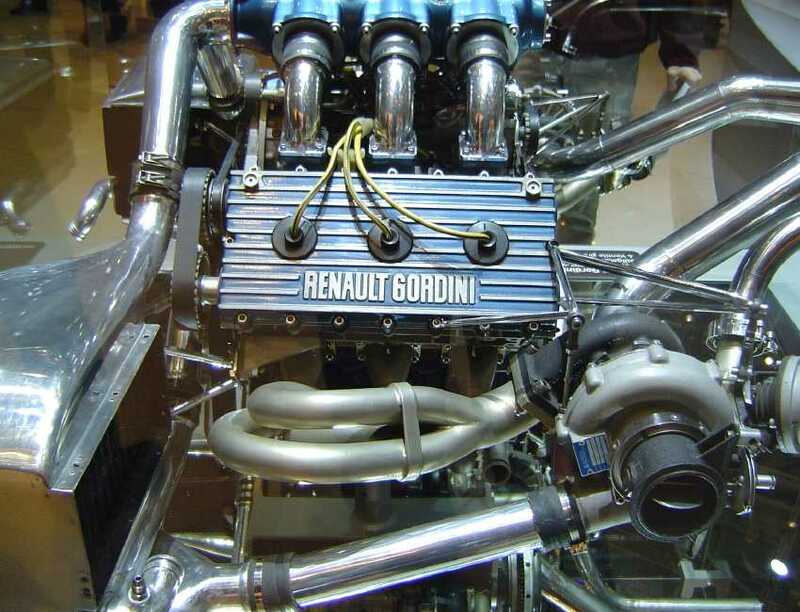 It is interesting to note the engine of the 1977 Renault was stamped with “Renault-Gordini”, in honour of Amedee Gordini, who built the only French car to compete seriously in Grand Prix racing in the 1950’s.